It looks at the defaultSsid parameter in nodes’ agent submodule. Nodes with the same SSID are assumed to be in the same wireless network. Members of wireless networks can be specified by the <wireless> element in the XML configuration. In the <wireless> element, the hosts and interfaces selector attributes can be used to specify members. Note that nodes need to use the same radio medium module to be in the same wireless network. This step uses the ConfiguratorC network defined in ConfiguratorC.ned. The network is displayed on the following image. The ConfiguratorC network extends ConfiguratorB by adding two wireless LANs, area1lan3 and area3lan3. The additional LANs consist of an AccessPoint and three WirelessHosts. The default SSID settings of all wireless nodes is "SSID". By default, the configurator would put them in the same wireless network, and assume that they can all reach each other directly. This would be reflected in the routes, hosts in area1lan3 would reach hosts in area3lan3 directly. This is obviously wrong, because they are out of range of each other. The two LANs need to be in two different wireless networks. 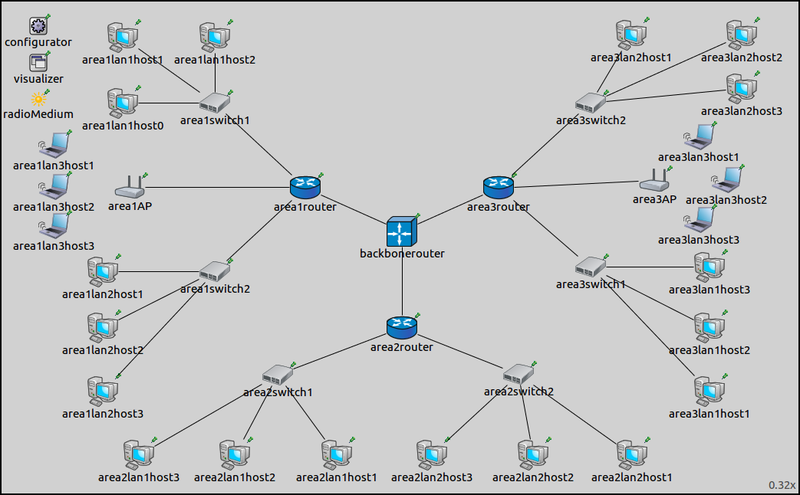 description = "Mixed wired/wireless network configuration - using <wireless> attribute"
A wireless host in area 1 is configured to ping a wireless host in area 3, which helps in visualizing routes. There is a setting in the General configuration pertaining to wireless networks: the control bit rate of all wireless nodes is set to 54 Mbps for faster ACK transmissions. The XML configuration uses the same hierarchical addressing scheme as in Step 7. The two wireless LANs are specified to be in separate wireless networks. Note that the wireless interfaces of the access points also belong to the wireless networks. The addresses and routes are indicated on the following image. 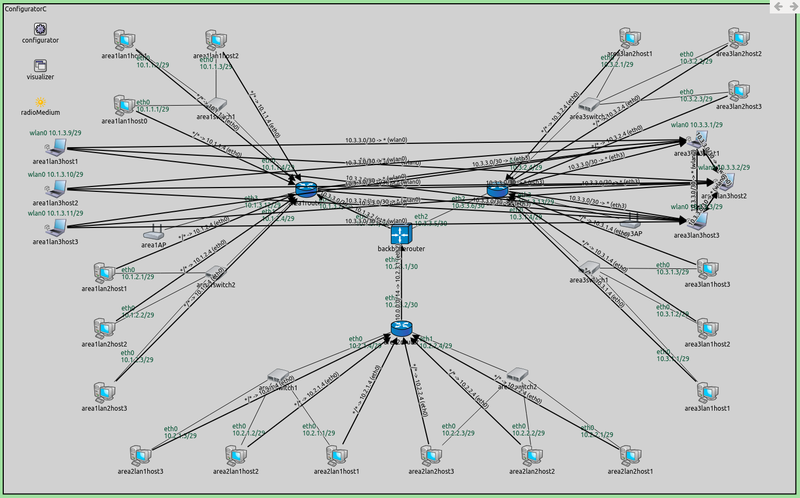 Routes leading towards hosts area3lan3 are visualized. Wireless hosts connect to the router through the access points. The access points are L2 devices, similar to switches, so they are transparent for the routing table visualizer arrows. Wireless hosts get associated with their corresponding access points before they can communicate with the rest of the network. On the following video, area1lan3host2 pings area3lan3host2. Transmissions are sent to all wireless nodes, but only those in communication range can receive them correctly (i.e. 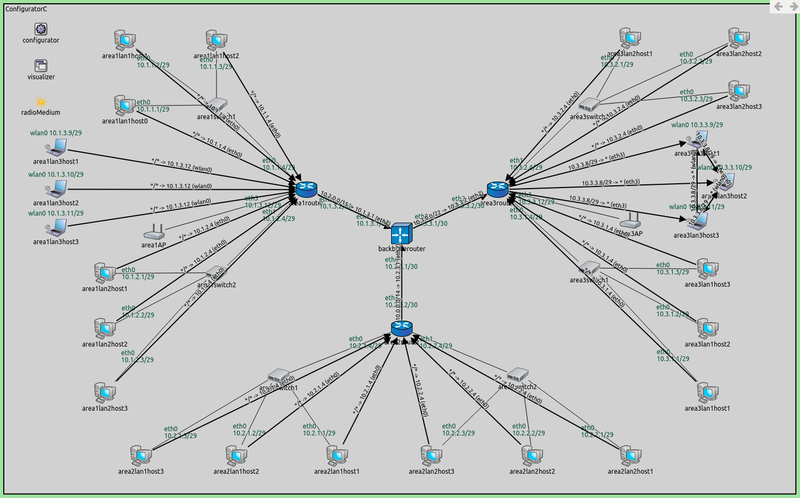 nodes in the same LAN). In both ways, area3lan3 is two hops away from the backbonerouter. Routes are configured according to hop count, and the configurator chose the first way. In this part, the SSID is used to put the two wireless LANs in two different wireless networks. description = "Mixed wired/wireless network configuration - using SSID"
The XML configuration in step8b.xml (displayed below) is the same as the XML configuration for Part A, except there are no <wireless> elements that defined wireless networks. They are not needed because different SSIDs are configured for the members of the two wireless LANs. The results are the same as in the previous part. The two wireless LANs are considered to be different wireless networks.